Have your birthday party at Bike Stop Café! Throw your child an amazing birthday baking party and let us clean up the mess! Decorate your very own birthday cupcakes and bake party pizzas for all of your guests Or choose our vegan birthday options! 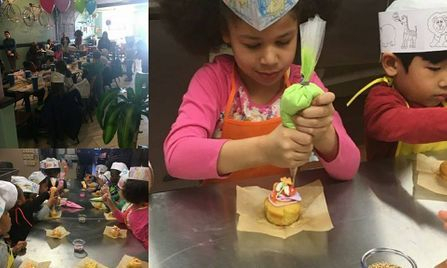 All kids leave with a personalized chef hat and awesome memories. Great idea for an adult birthday! A truly unique birthday party- A cooking Party! Finally! A party your vegan friends can attend! Fill out the form below to begin your baking party registration! Thank you for your class request. We will get back to you as soon as possible. All Reservations require a $25 non refundable deposit. After we confirm your date, we will call for your reservation payment. Remainder due prior to event date.